But hey, tomorrow is Valentine’s Day. You deserve a little chocolate without the guilt. These chocolate dipped strawberries are only seventeen calories each, and they’re super-easy to make. Note: You’ll need 1 tablespoon of chips for every five strawberries. Wash strawberries and allow to dry. Place chocolate chips in a microwave-safe bowl. Microwave for 30 seconds. Stir chocolate until smooth as velvet. If all the chips haven’t melted, continue microwaving fifteen seconds at a time and stirring in-between. Dip strawberries in chocolate coating half to three-quarters of the berry. Place on a wax paper covered plate. 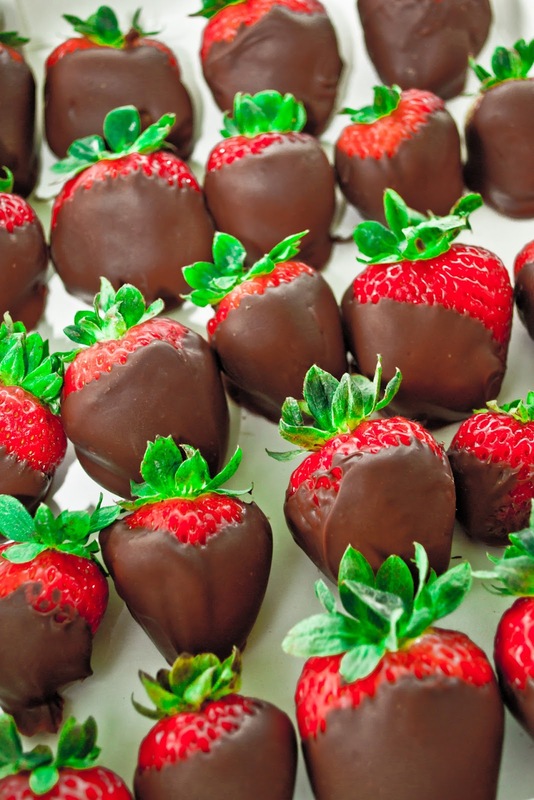 Place the plate of dipped strawberries in the refrigerator for 30 minutes before serving. Happy low-calorie Valentine’s Day to all you chocolate lovers out there! Two of my favorite treats -- chocolate and strawberries!